The Pixel Pergola is a permanent addition to the grounds of a school in Ireland. 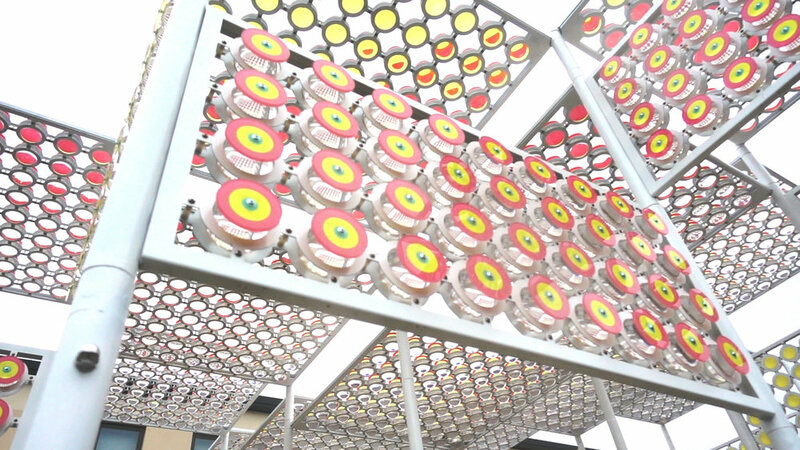 The Project is a reinvention of a classic “Pergola” structure which is typically “a structure usually consisting of parallel colonnades supporting an open roof of girders and cross rafters.” Rather than using plants to activate the pergola as is often the case, the structure utilises many acrylic spheres with a coloured discs behind to create “pixels” that change colour as you move through the space. This effect is designed to encourage the students of the college to feel more physically present in the space – an important tool in the practice of mindfulness.